Some people tend to call “manta ray” to any species having resemblance to it, especially with members of the genus Mobula since they are extremely similar in relation to their physical appearance. This is not correct, since the word “manta ray” only applies to 2 members of the genus Manta: giant manta ray (Manta birostris) and reef manta (Manta alfredi). How can you differentiate mantra rays from their closest relatives? There are a number of specific characteristics which, though less obvious than size, are useful to recognize a manta ray. 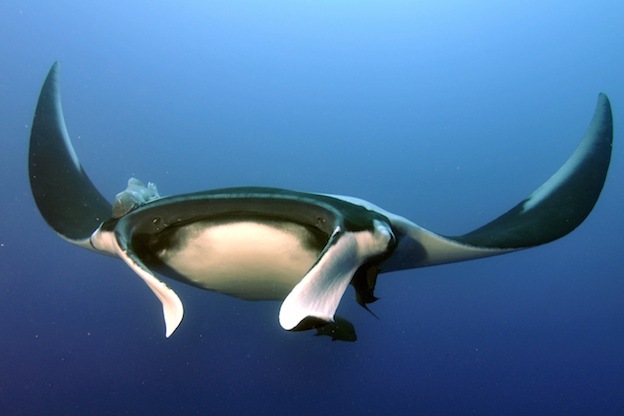 In general, every member of the genus Manta has a large and flattened body whose center is called “disco”. The reef manta ray disc has a width of 3 to 3.5 meters, while the giant manta ray lives up to its name measuring up to 9 meters wide. The head of both species is wide, eyes on each side and the long nose in front. Within it are several rows of small, square teeth that are not useful to chew food, but is used by the males to hold the female during mating. On the sides of the body the pectoral, large and triangular shaped fins are located. When the manta ray swims it often flaps its wings up-down rather than swelling them like rays living on the ocean floor, this makes them seem as if they were flying. In front of the mouth they have two structures called cephalic lobes which extend and help to introduce water into the mouth for feeding activities. On the underside of the body gill slits are located. The small dorsal fin is positioned in the upper body, at the base of the tail. It is long and thin but shorter than its body; the tail of the giant manta ray is somewhat flattened. In any species not presenting a poisonous sting. The skin of these animals is rough to the touch because it has conical dermal denticles, similar to tooth structures. Additionally, it is covered with a layer of mucus that protects it from infections. The color varies, as each individual has a unique pattern of spots that identifies them. In general, the upper body is black or dark brown while the bottom is white. Manta alfredi has a Y-shaped patch in the upper head region, while, the patch of the giant oceanic manta ray is T-shaped, with less presence of white coloration. In addition, the mouth of the first is white and not black as that of the giant manta ray, whose lower edges of the wings are colored in black or a darker shade, which can be seen when watching it swimming from below. Manta rays possess the largest brains of all fish, but definitely, the title of “the biggest brain of them all” belongs to the oceanic manta ray. This organ has something called rete mirabile, a network of veins and arteries whose function is to keep the heat in some parts of the body. They all have gills that are part of their respiratory system, since they obtain oxygen from the water. Females may be slightly larger than the males, which have a pair of copulatory organs called claspers, one of which they insert into the female’s cloaca for fertilization. Food filtering is performed by a gill rakers located between the gills and composed of pinkish or brown tissue. Could you now differentiate a stingray from a manta ray?